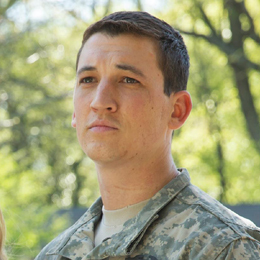 Miles Teller wants you to be frustrated—especially after watching one of his latest two films. The 30-year-old, Pennsylvania-born actor, who has roots in Cape May, has appeared in countless films over the years, earning recognition in honor of his rising-star status. From his first film, Teller swooned audience members with his portrayal of the can’t-dance best friend, Willard, in the 2011 remake of Footloose, followed by the coming-of-age film, The Spectacular Now, starring opposite of Shailene Woodley. He then took the lead role of a promising jazz drummer in the Academy Award-nominated film, Whiplash, which was written and directed by fellow New Jersey native Damien Chazelle. Teller has since gone on to star in the fan-favorite Divergent series and the cult-classic Fantastic Four, followed by War Dogs and most recently, Bleed for This, a biopic based on the life of former world champion boxer Vinny Pazienza. Biopics, it appears, seems to be Teller’s strong suit, as he stars currently in Only the Brave and Thank You for Your Service, both films based on true events, both physically and emotionally demanding and each released within a week of one another. First up is Only the Brave, a film based on the true events that preceded the fate of a group of specialist wildfire fighters, who are trained in wildfire suppression tactics. The crew, the Granite Mountain Hotshots, accounted for the biggest firefighter tragedy this country has seen since 9/11. Starring alongside Hollywood heavyweights including Jeff Bridges, Josh Brolin and Jennifer Connelly, Teller is cast as Brendan “Donut” McDonough, and in preparation for his role, endured a boot camp alongside his fellow cast of hotshots. Next is Thank You for Your Service, also based on true events adapted from Pulitzer Prize-winning journalist David Finkel’s 2013 nonfictional book of the same title. It chronicles the lives of several soldiers following their deployments as they readjust to life back home and the difficulties that lie ahead of them and their loved ones. Teller, who plays Sgt. Adam Schumann, also endured boot camp for the role, but more so to learn the dynamics of the job or as he puts it, “to try to make us into soldiers in just a week.” What many would consider the sequel to 2014’s American Sniper, Thank You for Your Service directly addresses post-traumatic stress disorder amongst veterans— not to mention, director and screenwriter Jason Hall wrote both screenplays. With heavy themes in both films, Teller captures each character’s true stoicism and authenticity, further solidifying his rise to a triple-threat actor. His ability to relate to each character is a trait he credits to his childhood, having grown up in various communities starting in Pennsylvania, all the way through to Georgia, Delaware, New Jersey and Florida. So, why should we be frustrated? Teller tells us why. SOUTH JERSEY MAGAZINE: Your most recent films, including 2016’s Bleed for This, are all based on true stories. Would you say you’re more interested in playing these types of roles? MILES TELLER: I’m interested in great stories … and I’ve been lucky to get that opportunity to work on these movies that are absolutely aligned with stories that I want to tell and I’m going to represent in this business. So fictional or nonfictional, hopefully you’re still getting to work on interesting characters and dynamic and complex people, and look, if someone is doing a movie about your life, then you probably lived an incredible life. SJM: Your two new films deal with heavy subject matter: Only the Brave honors the Granite Mountain Hotshots, while Thank You for Your Service is about post-traumatic stress, survivor’s guilt and war. How did you prepare yourself to really dive deep into these characters? MT: They’re both different in terms of the prepping because Brendan absolutely afterwards was dealing with post-traumatic stress, survivor’s guilt and all those things, but when you play him in the movie, he’s not dealing with those things. With Adam, that was a lot because I was having to play a staff sergeant who had just finished his third deployment. I was having to relate to war on a personal level and it’s impossible, honestly. If you haven’t been to war, you really can’t relate, but I can relate to Adam in terms of what he was dealing with. I just really empathized with him a lot, so I was reading as many books as I could, hanging out with him, which allowed me to get inside his skin a little bit and be around vets. If you have a sense of compassion, then you’re going to want to do everything you can to tell this story honestly. SJM: How was working with Adam throughout that process? MT: It was great. All of this was a very tough moment in his life and he’s still dealing with it all and he’s doing better as time passes and for him, this movie was very therapeutic. He just came into it with a really open mind and heart, and opened himself up to us and because [of that], we’re able to replicate his experience and he feels when he watches it that it’s really an authentic portrayal. SJM: Was there a specific aspect in each film that was hard for you or affected you? MT: It’s hard to even just vicariously go through this experience and then not affect you in a very personal way. Both of these stories stuck with me and when I watch them, it brought me right back to that place, but these guys endured a lot and … you feel an obligation to them, so it was really an honor for me to be able to tell their story. SJM: What was especially difficult: That these films were based on true events or the weight of the subject matter? MT: Only the Brave was a lot of fun, truly. I think when people watch it, they’re going to be smiling and laughing for most of the film and then obviously, the ending is tough, and it’s not which one is more difficult or anything, but what I will say is that in Thank You for Your Service from the moment that movie starts, you’re representing a character who just finished his third deployment, who just carried his buddy down the stairs who was—he thought—basically dying in his arms, a guy that has seen a ton and that reintegration process for these soldiers coming home is incredibly, incredibly difficult. We have 22 vets a day committing suicide, so that movie was very tough. I never felt comfortable. There are very few moments in that [film] where Adam is actually able to enjoy his life. SJM: Thank You for Your Service really brings to light the issues veterans face and the lack of options that are available to them and some viewers might not understand until they watch this film. What are your hopes that this movie can change or affect viewers? MT: We’ve done some screenings for the [U.S. Department of Veterans Affairs] and for congressmen, who saw the movie and it motivated them to try [to figure out] what can they do to help and how can they make this situation better [for] these guys. For audience members, we’re in a war that we’ve been in for 16 years and we’re not fighting a country necessarily, we’re fighting terrorism, and it just doesn’t have that same feel that WWII did [where] guys were coming back to victory day parades and everyone was having babies. It’s kind of reminiscent of Vietnam. We’re in a war that people don’t necessarily agree with and soldiers are kind of looked at as propaganda when you’re pro-war, anti-war, which party are you a part of, and I think this movie will strip that away. I think it will help people realize this is somebody’s son, this is somebody’s daughter, this is somebody’s husband, brother. We’re all in this together and these are incredibly brave men and women that are fighting for our country, and regardless of your feelings on war, I think it will help humanize it and create some empathy and compassion, and hopefully people will get frustrated with what we’re not doing for these guys. SJM: Jason Hall, the director and screenwriter of Thank You for Your Service, was recently quoted as saying, “there’s a real comfort and ease and everyman quality” that you bring. How did you do that with this role? MT: I don’t know. I think I grew up with the everyman … just in terms of middle class. I lived in a bunch of different states growing up and I was part of a lot of different communities and for most of my life, I grew up in just a small town. It could have been anywhere and I think a lot of that was kind of instilled [in] me at a young age with my mom. She wanted to raise her kids to be able to … hang and talk to a construction worker, the elderly or kids. Talk to anybody in any kind walk of life and I feel like I relate to people on all different kinds of levels—professional and economic class have nothing to do with it. It’s just about the human being. SJM: Tell me a bit about growing up in this area. You were born in Downingtown, Pa.? MT: Yeah, my dad is from Wilkes Barre and his mom, my grandmom, still lives there. A lot of my family lives there, around there or in Malvern. [My] cousins went to Penn State, [my] uncles went to Penn State, my dad is all Pennsylvania and then my mom’s side of the family is from South Jersey: Penns Grove, Alloway and [the] Salem area, that’s where my roots are. That’s where my family comes from, the Northeast, and it always holds a special place in my heart. It’s got a certain flavor to it, it’s just a certain kind of person that you’re not going to find anywhere else. The Northeast absolutely has its identity intact and I love it. I go up to Philly when I can, I have a lot of cousins there, and we’re a big seafood family. We love blue crab, so we have a crab feast every other year, and we’ll rent a house in Wildwood Crest or Ocean City and we just bring in a bunch of bushels of blue crab and the crab feast has been going on for like 30 years, everyone has crab Tshirts and crab flags. That’s our family’s thing and then to eat in Philly, we like Dinardo’s, they do the blue crabs right with Old Bay on them and steaming jumbos. SJM: You’re a big Phillies fan—to the point where your fiancée, Keleigh Sperry, has mentioned on Instagram that it’s rare to take a selfie of you two without your Phillies hat on. Tell me about growing up a Phillies fan and recently throwing out the first pitch at spring training. MT: Yeah spring training, I felt that was a good way for me to warm up before I do the big leagues (laughs). In Florida, we’re always going to Clearwater to watch the Phillies and that part was so fun. 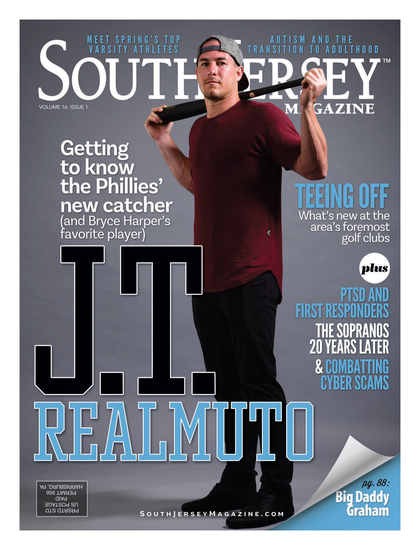 … In South Jersey, Cape May, where I was only an hour-and-ahalf from Philly, my favorite player was [the late] Darren Daulton, and I loved that ’93 team and the Vet. I’m sure a lot of your readers can relate to going to the Vet. ... I go to Flyers and Eagles games and I’m always repping my team—especially the Phillies and the Eagles. SJM: How was the experience of growing up in Pennsylvania and then moving to Cape May? MT: I moved there, I think, in ’95? Well, I went from Pennsylvania to Georgia, to Delaware to New Jersey. Cape May, it’s just such a wonderful place to grow up. … I grew up in Tranquility, which is just before the bridge, so [me and my buddies] would ride our bikes over the bridge with our boogie boards and ride each other on handlebars and going down the beaches, going to the boardwalk, arcades and everything. It’s just such an incredible town, it’s just Victorian, bed and breakfast, quaint, really classy place and the people who live there are wonderful. My dad was driving to work like an hour-and-a-half to two hours each way just so we could live there. It was a really wonderful time that I absolutely loved growing up there and riding our Beach Cruisers around and having fun. SJM: When did you decide acting was your future? MT: I played sports, I played baseball pretty much year-round, I played drums in a rock band, so I was always into music and sports. Then I had a really good buddy of mine [where] one day he was like, ‘Hey man, I took a drama class. … I think I’m going to audition for this play, you want to do it?’ I said, ‘Yeah, sure.’ We did it and it was kind of that moment for me. I got on stage and I got a laugh or got some applause and I felt like it was something that I could really put my energy toward. We also had a drama teacher [at Lecanto High School in Citrus County, Florida], Beth Bedee, and without meeting her, without having the kind of curriculum that she brought, I don’t know if I would have thought to become an actor, honestly. She just really ran an efficient, professional program and we were doing some great stuff just as kids. We took a lot of pride in it and she was a big part of my life and the reason why I’m here right now. SJM: Now that you’re here, what projects do you have coming up? MT: [A series] for Amazon, it will be 10 episodes that get released. It’s its own thing and that’s going to be really fun to work on with [Nicolas Winding] Refn, a guy who I’ve seen a lot of his work and I feel like he’s a really special person in this business. He’s really a good filmmaker, truly an artist. … I’m always trying to do something different, whether it turns out like that or not, but I’m always trying to do something different and this is certainly different than anything I’ve done. … It will be intense, I think once [viewers] start the first one, they’ll watch it, all 10 episodes. … I’m also doing some voice-over sessions, I’m doing an animated movie called The Ark and the Aardvark, and it’s been fun. SJM: Going back to Only the Brave, what was your experience starring alongside heavyweight actors like Josh Brolin, Jeff Bridges and Jennifer Connelly? MT: It was incredible. To be working with Academy Award winners and nominees and people that have worked at a really high level for as long as so many of the people you mentioned have, it’s nice. It also kind of inspires and motivates you to be on your game. You have a lot of [these] really big actors who have all been the leads in movies, respectively, taking smaller roles for this just because everyone really felt strongly about the material and wanting to honor these guys. SJM: Looking at your own extensive and successful career, was there any movie in particular that was your favorite? MT: They’re all special. I remember Footloose was special because I played that part in high school, the very first play I did was Footloose and I played Willard. Everyone in that movie, it was all their first movie or their first studio movie and … it just had such a fun feeling to it. These last few movies I did were great, bonding with everybody and pretty much every movie I’ve done, I’ve enjoyed making.